Contact Kenmare Coach and Cab - Taxis, Tours, Coaches, Buses, Mini-Buses, Wedding Cars and more. 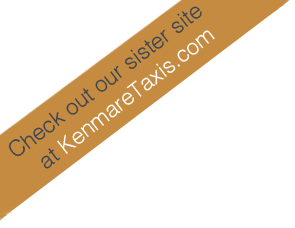 You can email Kenmare Coach and Cab here via our contact form or directly at: info@kenmarecoachandcab.com. "We had a great time touring with you Declan. We will definitly be returning to kenmare again on our next visit!"